A few years ago I finally went to New Orleans. I had wanted to go for so long, and I don't know that there was a reason per se why I hadn't; I simply hadn't taken that step. But, I finally made the arrangements. We stayed in a mansion converted into a bed & breakfast. We drove in, parked the car and didn't use it again until we drove away. One of the things that I had on my list of things to do (about the only thing) was the tour of the Garden District. The highlight of that tour was the cemetery. It is fascinating how they bury above the ground, and how they manage to get generations of families into the same tomb. The history of the city seems to be epitomized here – with the white marble, the weathered iron gate, the various stages of decomposure of the tombs themselves. Some had been renovated; some replaced and some were little more than piles of rubble. But, the names remain, the stories remain - those of the people and the city they inhabited. Somebody really had to think outside of the box to figure out a way to keep their dead from floating away in the inevitable flooding. They went against centuries of traditional European burials and created a way to keep their citizens safe from the diseases that could be brought about by corpses floating haphazardly through the streets. But, was it only that? As we walked through the French Quarter we noticed that places for rent or sale all indicated –on the real estate signs – whether or not the building was haunted. 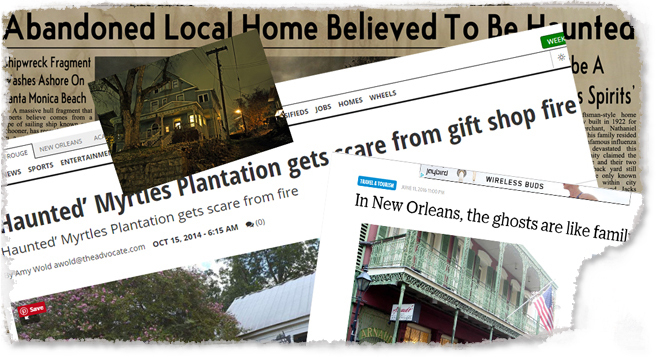 I suppose that in New Orleans some people might insist on a genuine haunting before shelling over money for rent, just to get the full experience. I read that basically every hotel in the city has either claimed to be haunted or has had the claim made for it. I have to wonder if, aside from keeping the dead buried, the tombs were an attempt to keep the spirits and spectres in the graveyard and away from the residents. Looking through some of my pictures from that trip I think I discovered why so much of the city is haunted. Rows of tombs, with centuries of names written in marble. 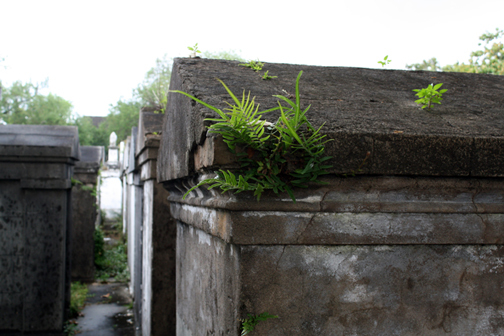 The weathered tombs were what I really came to New Orleans to see. I'm beginning to see why there are so many ghosts in this very old city. Is it really any surprise, after all? They've basically left the door open for the spirits to come be with them in the streets. 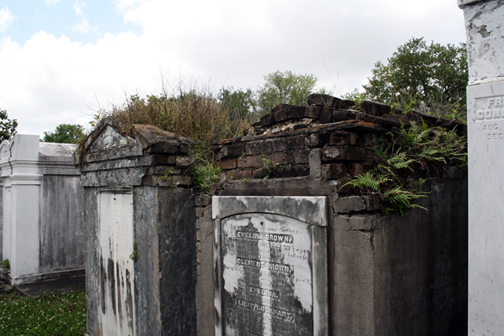 It's too late to undo the damage done by allowing the their tombs to fall into disrepair. They may be able to make the city and its cemeteries more presentable with a concerted effort to fix them, but centuries of ghosts are already loose – wreaking havoc or simply reveling with the visitors. The ghosts are as much, or more, a part of New Orleans as the current residents, and they add a texture of their own to the spirit of the city, much like the architecture adds to the landscape. It's best to accept them, to incorporate them into the lore and the way of life. There are many other places I want to visit, but I need to visit New Orleans again. I need to see the old buildings, drink the coffee, eat the food. Mostly, I need to go be with the tombs. I need to see the crumbling bricks and weather-stained marble. I need to sit with the spirits and listen to their stories. It's a world so different than my own. One trip wasn't nearly enough. There's so much left to learn.